Join us Saturday September 14 at 4:00 pm for a fabric presentation including me. "To Provide An Environment Where Artists And Community Meet, Work And Learn Together Through The Arts In Their Many Forms"
SATURDAY SEPTEMBER 14, 4pm: "Documenting the process of Art Making", followed by a potluck. Presentations by JOYCE HULBERT and MARION JAHAN, both in residence at AZULE, KATHY GOODSON, who lives in Madison County and BAILEY BARASH, who just completed the wonderful 10 minute film "AZULE Imagine..." with Manoj Sepiastory. "AZULE Imagine..." is now live in HD! Also coming up this month, SEPTEMBER 27-29, is a SKILLSHARE weekend, organized by OMARI FOX: "R & RSC: Rest & Resource for Social Change"
JOYCE HULBERT of Berkeley, CA is here on a two-week artist residency, where she is exploring color effects on silk for an upcoming tapestry she will weave as part of her Common Wheel series. Silk yarn is stretched to a specific length, then wrapped with plastic at intervals to produce a patterned weft once it is dyed. The plastic is removed after dying. Shown are dying experiments on silk, using silk-screen, wrapped resist (shibory) and immersion dying in a pot. MARION JAHAN of Paris, France is working on a Power Point presentation on Textile Design (Dye, Print, Weave, Knit), Paper-making, Framing and Cardboard Box making for Museum collections. 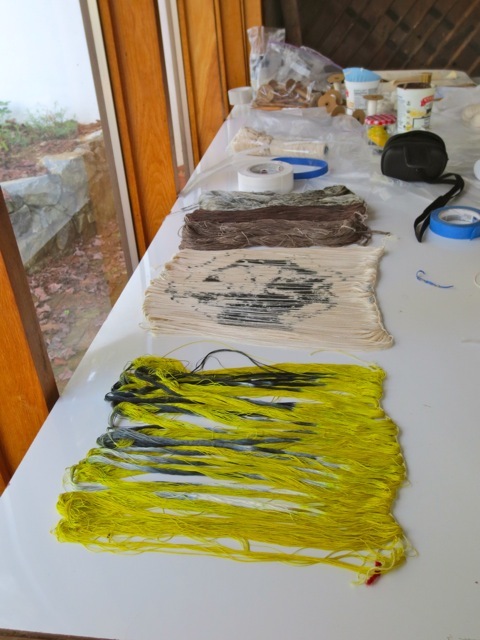 JENNIFER FADEL of Charlotte, SC is experimenting with fabric design and dyes around Paleolithic imagery on cotton. She is also sewing three colorful mattress covers, that she is donating to AZULE. Thank you so much again. Near Asheville, NC, take I-40 W toward Knoxville. Exit at exit 24 toward Hot Springs. You are now on Hwy. 209. Go about 18 miles, then take Gorenflow Rd. before you get to downtown Hot Springs. Take the first right and Azule is on the right.